Accepted papers (after blind review of at least 3 experts) will be published by CEUR–WS. The best paper (according to the reviewers’ rate) will be published within the main conference proceedings. 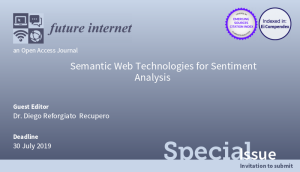 The authors of the accepted papers will be invited to extend their work for publication in the Special Issue “Semantic Web Technologies for Sentiment Analysis” of Future Internet.